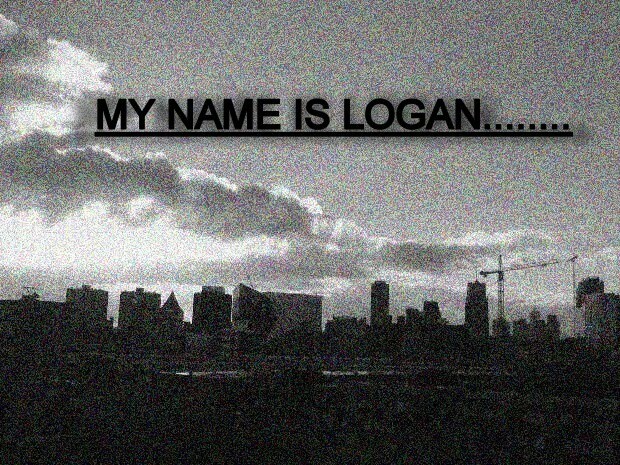 My name is Logan: Is it just me...? I just realized something. Maybe it's just something about myself and maybe it's something that has to do with people in general. Today, while I was standing on the curb waiting for the bus (yes, don't laugh, I still ride the bus to school - wanna fight about it? ), I watched as two police cars pulled up to the house across the street from mine. As soon as I saw the two middle-aged police officers step out of their cars in that black uniforms and shiny badges, I thought, 'please don't let my bus show up on time', because I really wanted to see what was going down - I mean, going on. Anyways, the two police officers casually strolled up the sidewalk to the front door of the house and one of them knocked. No answer at the door. Again, he knocked while the other police officer walked around the side of the house checking out the windows. Now, I don't really know much about our across the street neighbors. I think a young married couple and their three little kids live there. I've never seen anything suspicious going on there and I hadn't heard of any burglaries, vandalism or anything else like that in the neighborhood that might have the police checking things out. So I continued to watch, every once and while looking down the street to make sure my bus wasn't flying up, as one police officer continued to knock more and more forcefully on the door while the other continued to search around the house. After a couple of minutes, the front door to the house next to the one the police were searching opened, and two little dogs came running out into the yard, yelping and wagging their tails as if they'd finally been liberated from some horrible doggy prison. I could barely make out the figure of someone standing in the shadow of the doorway, but I couldn't tell if it was a man or a woman. The police officer who was knocking, when he saw the dogs and that the other neighbor's door was open, casually walked through the grass across the yard and started talking to the figure in the shadows. And that's when my bus pulled up, right between me and the intriguing little story that was unfolding before me. Disgusted, I climbed on the bus, found a seat to myself, and watched from the window as we pulled away. So this is what I learned. I (we, as people?) love it when 'things' happen out of the ordinary. We love it when 'things' go wrong or weird 'things' happen. I'm intentionally using that broad word, 'things' because it could be anything. It could be a pair of policemen checking out the neighbor's house. It could be an apartment fire. It could be a terrorist attack. It could be an auto accident. It could be a natural disaster like a hurricane or an earthquake. It could be an exposed plot by the government to brainwash the public. It could be a possible UFO sighting. It could be someone slipping on a banana peel. It could be anything, just as long as it's not TOO close to home, and, even then, we still like for things to happen close to us from time to time. When tragedy strikes, near or far, we think, "oh, that's awful", but deep inside we are drawn to tragic, odd, abnormal, shocking, (you name it) things that happen. Whenever out of the ordinary things happen, think of how proud you are if you are an on the scene witness! In a way, everyone is nosey, and we can't help it. I know EXACTLY what you mean. This is a really horrible (and horrifying) example, but I was at a homecoming dance a few weeks ago, and this girl was grinding with this guy, blah blah blah, but she had her dress pulled up so far that anyone that could see her could see her underwear. It's not like anyone WANTED to (ok, maybe some people did but not me, ha), but everyone could see. We were drawn in by the Whoa Factor. Thanks for sharing that intriguing little story. Now we ALL get to wonder what happened! Me too actually. especially car accidents, I drive really slow past them. Even fights and things like that. Nosey...that's a funny and accurate way of putting it. We end up feeling special to have seen something other people haven't. And just think about the news and why they report more depressing stories. But if you look at the positive side, if it's a tragedy at least it teaches some people to appreciate what they had. Just thought I'd comment about it. People are attracted to anything that is out of the ordinary, something different from the mundane activities they're used to in everyday life. I think the reason we're so interested when it comes to negative things, such as accidents, arrests, etc., is because we know that it could happen to us, so there is a certain morbid curiosity involved. And by the way, to change your template it really depends on the site you get the template from. Usually though, when you find a template that you like, there's an HTML code that you copy. You go to your Layout tab, then click on the Edit HTML button. Replace the code there with the new HTML code and save. All the sidebar widgets and such will be deleted, just to give you a heads-up.